Posted on December 6, 2010 by Ray Williams (NMLS #216267). Last Week in Review: The Jobs Report numbers for November are in. Find out what you need to know about the numbers behind the headline! Forecast for the Week: Volatility in the markets is sure to continue. Read the forecast below to see why. View: Want to “penalty-proof” your 2010 tax return? Read the View article below to act now. “Don’t believe the hype.” Unfortunately, the lyrics from Public Enemy’s hit song came true last week when the official Jobs Report for November was released. Overall, Traders were caught by surprise last Friday when the Jobs Report came in way below estimates. The private sector numbers also disappointed. But let’s look at some important information behind the headline number. First, on a positive note, last week’s report included upward revisions to the past two months. Those revisions showed that the economy produced 38,000 more jobs than previously reported. What caused these revisions? The headline number of jobs lost or created comes from the Business Survey or CES (Current Employment Statistics) Survey, which surveys about 140,000 businesses and government agencies – and uses the birth/death ratio to help calculate or guesstimate the monthly number. Because there are often inaccuracies with that guesstimate, the real final numbers show up in future monthly revisions. Second, on a grim note, the Unemployment Rate ticked up to 9.8%, from the prior month’s 9.6%. It’s important to note that the unemployment rate is derived from a survey from the Labor Department called the Household Survey or Current Population Survey (CPS) – and this survey is more accurate than the business survey as the information comes from actual phone calls to 50,000-60,000 households. Was the recent string of economic reports more hype than actual signs that the economy was improving? Will future reports coincide with last Friday’s weak Jobs Report? Or was the Jobs Report’s weak reading just a small bump on the road to recovery, with potential future upward revisions tempering November’s numbers like we saw happen with the last two months? Time will tell, but one thing is for sure: The Fed was watching the Jobs Report closely and will likely use the weak report as evidence to pump the full dose of Quantitative Easing 2 (QE2) into the economy. Remember, Quantitative Easing is the concept of the Fed becoming a buyer of Treasuries and Bonds to try and stimulate the economy. While QE2 may be good for the economy, it is likely to be unfriendly to Bonds and home loan rates, as we saw last week when Bonds and home loan rates ended the week worse than where they began. Compared to last week’s busy economic report calendar, this week is light on scheduled reports. But between QE2, Treasury auctions, and the uncertainty in Europe, the volatility in our markets is sure to continue… and that’s certainly no hype. Thursday brings the Initial and Continuing Jobless Claims Report. Last week, Initial Claims were reported above expectations at 436,000. However the 4-week moving average did decline to the lowest reading since August 2, 2008. While this was good news, it was tempered by the weaker-than-expected Jobs Report data last Friday. Remember, we need to see Initial Claims make a sustained movement below 400,000 for the market to feel confident that labor is recovering. Also, the Treasury will sell $32 Billion in 3-Year Notes on Tuesday, $21 Billion in 10-Years on Wednesday and $13 Billion in 30-Year Bonds on Thursday. It will be interesting to see how these auctions perform in light of the recent spike higher in yields. Ending the week will be the Consumer Sentiment Index on Friday. 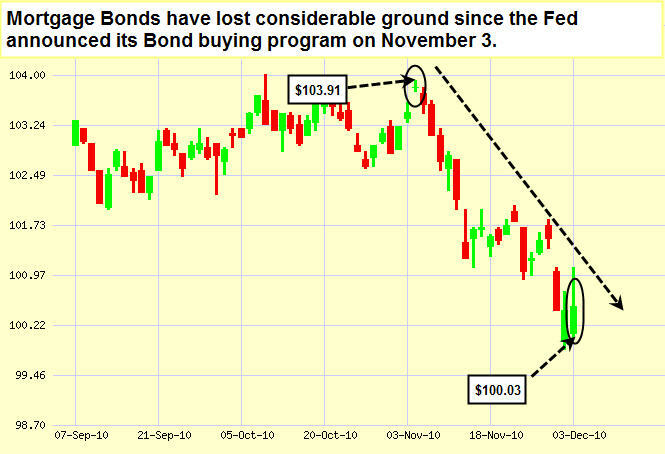 As you can see in the chart below, Bonds and home loan rates have worsened over the last month since the start of QE2. Despite this, an opportunity still exists, as home loan rates are still at historically low levels for now. Give me a call if you want to review your situation, or forward this email to a friend, family member or colleague who might benefit. I’m always happy to talk to your referrals and provide a complimentary consultation. When you file your tax return each year, the amount of tax withheld from your paycheck or submitted through estimated quarterly tax payments ideally should match the amount of tax you owe. In reality, that seldom happens. Most Americans are addicted to tax refunds, as evidenced by the fact that the average income-tax refund rose again this year to a record of nearly $2,900. In essence, more than 75% of U.S. taxpayers gave Uncle Sam an interest-free loan. Many of the remaining taxpayers ended up owing money, and some had to fork over an extra 10% penalty for having too little tax withheld throughout the year. Both situations are easy to remedy, but you have to act before the end of the year. Just file a revised Form W-4 with your employer. The more “allowances” you claim on the W-4, the less tax will be withheld; the fewer you claim, the more tax will be withheld. You can also ask your employer to withhold a flat amount from your paycheck. If you regularly get a refund, you’ve already banked most of it and will still get a refund next spring. But you can stop the leakage from your last few paychecks of the year by adjusting your W-4 now. Worksheets that come with the W-4 will help, or you can struggle through the IRS’s online withholding calculator. But we’ve got a better idea. If your current financial situation is similar to last year’s, just use our Tax Withholding Calculator. Answer three simple questions (you’ll find the answers on your 2009 tax return) and we’ll estimate how many additional allowances you deserve — and even show you how much your take-home pay will rise starting next payday, if you claim the allowances on a new W-4. (However, this shortcut won’t be much help if your tax situation has changed since last year because, for example, you have a new baby or got a new job). If you have both wage and consulting income and expect to owe money on your tax return, boost the taxes withheld from your last few paychecks rather than trying to make up the shortfall with your final estimated quarterly payment due January 18, 2011 (because January 15 is a Saturday and the following Monday is a federal holiday). Taxes that are withheld are treated as if they were spread out evenly throughout the year, sidestepping an underpayment penalty; the estimated-tax-payment approach does not. Reprinted with permission. All Contents ©2010 The Kiplinger Washington Editors. www.kiplinger.com.